J. The Scapular of the Immaculate Heart of Mary. This scapular originated with the Sons of the lmmaculate Heart of Mary in 1877, and was sanctioned and endowed with indulgences by Pius IX on 11 May of that year. The scapular was later approved by the Congregation of Rites in 1907, and its form more exactly decreed; in the same year it was assigned new indulgences. The superior general of the above congregation can communicate to other priests the faculty of blessing and investing with this scapular ("Acta Pontificia", Rome, March 1911, appendix). 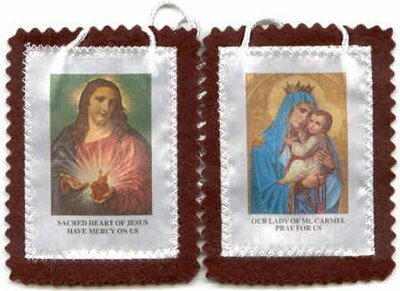 The scapular is of white woollen cloth: on the portion which hangs before the breast is represented the burning heart of Mary, out of which grows a lily; the heart is encircled by a wreath of roses and pierced with a sword. O. The Scapular of The Most Sacred Heart of Jesus. The constant wearing of a small picture of the Heart of Jesus was already recommended by Blessed Margaret Mary Alacoque, who herself made and distributed them. They were made of a small piece of white woollen cloth, on which was embroidered or sewed in red a picture of the Heart of Jesus. This badge was especially employed during the plague at Marseilles as a protection against the pest. During the terrors of the French Revolution it also served as a safeguard for the pious faithful. Although this badge is often called a scapular, it is not really such; consequently the conditions governing scapulars do not apply to it. It was only in 1872 that an indulgence was granted by Pius IX for the wearing of this badge. A real scapular of the Sacred Heart was first introduced in France in 1876 when it was approved by Decree of the Congregation of Rites and a special formula for blessing and investing with it appointed 4 April, 1900. This scapular consists of two segments of white woollen cloth connected in the usual manner by two strings; one segment bears the usual representation of the Sacred Heart, while the other bears that of the Blessed Virgin under the title of Mother of Mercy. By a Brief of 10 July, Leo XIII granted many indulgences for the pious wearing of this scapular. Our Lord taught us to say the "Our Father." Mary taught us the value of the Scapular. When we use it as a prayer, Our Lady draws us to the Sacred Heart of her Divine Son. 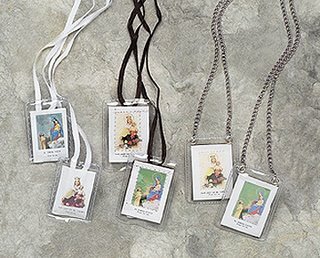 It is well, therefore, to HOLD THE SCAPULAR IN THE HAND while addressing Our Lady. A prayer uttered thus, while holding the mystical Scapular, is as perfect as a prayer can be. It is especially in TIME OF TEMPTATION that we need the powerful intercession of God's Mother. The evil spirit is utterly powerless when a Scapular-wearer, besides his silent devotion, faces temptation calling upon Mary. "If thou hadst recommended thyself to me, thou wouldst not have run into danger," was Our Lady's gentle reproach to Blessed Alan de la Roche. O my God, in union with the Immaculate Heart of Mary (here kiss your Scapular as a sign of your consecration; partial indulgence also), I offer Thee the Precious Blood of Jesus from all the altars throughout the world, joining with It the offering of my every thought, word and action of this day. 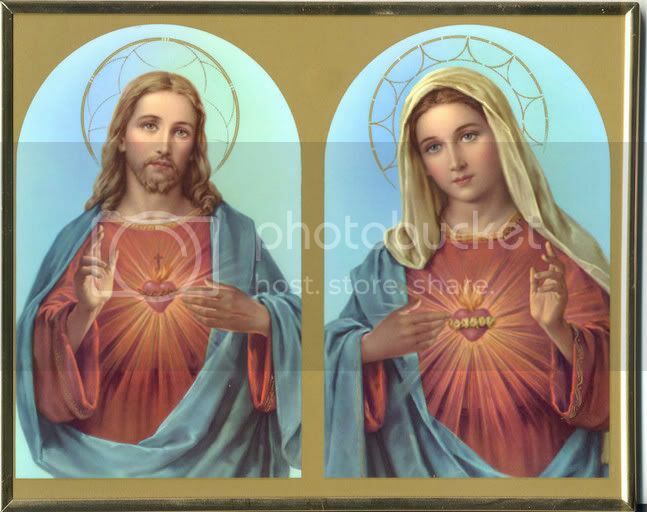 O my Jesus, I desire today to gain every indulgence and merit I can and I offer them together with myself, to Mary Immaculate, that she may best apply them in the interest of Thy most Sacred Heart. Precious Blood of Jesus, save us! Immaculate Heart of Mary, pray for us! Sacred Heart of Jesus, have mercy on us!